Disclaimer: We received the Sleep ZZZ Pillow for free to review, but the opinions here are my own. Recently, we got a Sleep ZZZ Pillow to try out. 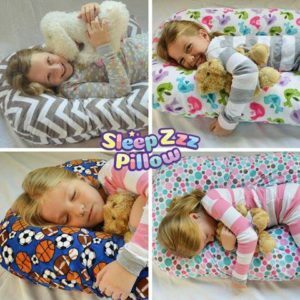 These were seen on “Shark Tank.” I got the child’s size and my daughter who is nine loves it! When we first got it, she was afraid that it might be too small for her, but it actually fits perfect. They are recommended for age three and up. She has been sleeping on it every night and couldn’t be happier. It would probably fit a younger child a bit better. Before doing my review, I went to my daughter and said okay tell me about this pillow. In her words, she used to be grumpy when she woke up and now she wakes up in a better mood. She loves the way it wraps around her and it really does seem like she is getting a better night’s sleep now. A less grumpy child is always a win for this mom! I love that it came with a cover, but if she wants to change it out then we can order a different cover for it. The pillow retails for $49.99 and the extra covers are $19.99. So far, we love her Sleep ZZZ Pillow! Maybe I should get one for myself next! They do make adult sizes.